The first manual transmission was invented by the French firm of Panhard and Levassor in 1894, and it had 3 speeds and set a basic design layout still in use today. This gearbox had 3 shafts onto which the gears were attached, an input shaft, a main or output shaft and a lay shaft. Post war Standard-Triumph had already developed a gearbox for the Standard Vanguard in 1947 which at the time coincided with its one model policy. This gearbox evolved into that used in later TRs, the 2000/2.5 and the Stag. However with the introduction of the new small car (SC), the Standard 8 in 1953, a new gearbox was required as the Vanguard gearbox was too big. This new gearbox was designed by Ron Sidney. It was a conventional 3-rail design, had a separate rear case to accommodate the end of the main shaft (as did the Vanguard ‘box), synchromesh on the top three ratios, and a direct-action gear change with a long gear lever. Unlike the Vanguard ‘box the bellhousing was a separate housing. In 1957 a remote-control change was introduced for the Standard Pennant and this continued for all other models throughout the life of the gearbox. In 1966 synchromesh was fitted to all four forward ratios for both the GT6 and Vitesse, with the introduction of the 2 litre engine into the ‘small chassis’ cars, however this never migrated to the later Heralds. In the picture below the gear selector rails are highlighted in green. The later Spitfire 1500 had an alleged ‘Marina’ derived single rail all-synchromesh gearbox, but this was never fitted to the GT6 which by this time had been discontinued (it seems that the ‘Marina’ gearbox was itself a development of an existing Triumph design). In a single rail design all the gear forks are supported on a common rail/shaft. The advantage of this design is that it was more compact, lighter in weight and less costly to produce. 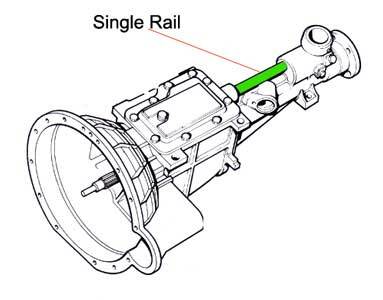 In the picture below the single gear selector rail is highlighted in green. Which is best, single or 3-rail? The 3-rail tends to wear more at the gear linkage and also the main shaft front tip bearing is only ½” (around 13mm). The single rail has a more robust gear linkage and the main shaft front tip bearing is bigger at 18mm, but otherwise the parts inside are very similar. Many parts are interchangeable; it is possible to build a more robust 3-rail gearbox with an 18mm tipped main shaft. The GT6 all-synchromesh gearbox was a new design developed from that of the Vitesse, making use of several well-proved Vitesse components. The aluminium alloy bellhousing is a separate casing to the cast iron gearbox casing, a new design developed to accommodate the re-arranged gears and synchromesh mechanism on bottom gear. Attached to the rear is the extension which houses the tail end of the mainshaft. On the Spitfire and Vitesse gearboxes, first gear and reverse are engaged by sliding the non-synchronized mainshaft gear into mesh with the appropriate train. 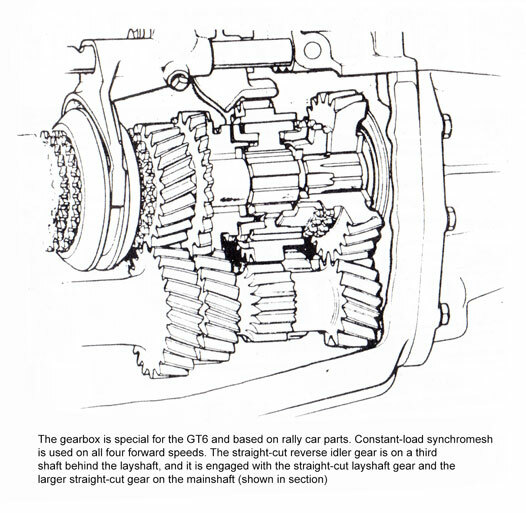 On the GT6 the first gear is in constant mesh, but free to rotate on the mainshaft to which it is connected by the dog-teeth of the synchromesh mechanism. 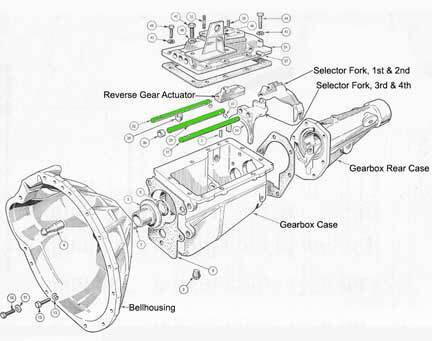 Reverse is engaged by sliding the reverse idler idler into line with the reverse gears on the layshaft and mainshaft; the mainshaft gear is part of the synchromesh assembly for 1st and 2nd gears. Synchromesh is of the constant-load type common to all Triumph models except the 1300; it should inherit the robust effectiveness of the previous designs. Ratios are very close, with bottom gear high at 8.66 to 1. The car is reputed to reach 46 mph in bottom, 68 mph in 2nd, and no less than 96 mph in third. This gearbox was first developed on prototype competition Spitfires during 1964 and 1965. The above is from the Autocar article published in Turning Circle APRIL 1983 No.4. * The above diameter of 22.6 ins is based on 70 section tyres, with which I believe the majority of GT6s are fitted these days. From the above, in a non-overdrive GT6 which is normally fitted with the 3.27 differential, running at 70 mph in fourth, the engine is turning over at 3,404 rpm. Given that peak power is at 5,300 rpm (Mk3) a theoretical top speed of 109 mph can be calculated.